It’s been a really busy few weeks in the studio lately. 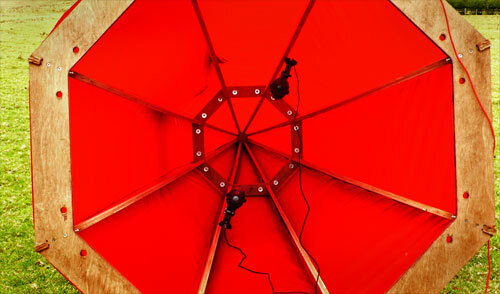 We seem to be shipping out a new installation every week at the moment. I’ve hardly had a spare second to sit down and think. So a bit of a quick post this one. Spires. They seem to have been the big chunk of my year so far, so here’s the story. 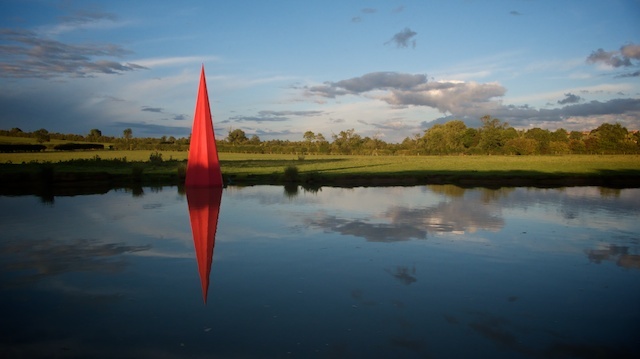 SevenSpires was a half-mile long installation in the Oxford Canal around the Northamptonshire village of Braunston. Seven red spires, each standing over four metres above the water follow the meandering line of the canal, their form echoing that of All Saints Church in the village above. It started earlier on in the year when I had to find a location on the canal network in Northamptonshire for the installation. The original proposal was fr the River Nene on the other side of the county, but things were getting complicated there and I had to have a piece in for August. I walked the best part of 30 miles of towpath looking for a spot where the canal said something about the landscape and the piece would fit in a meaningful way. I first came across the location late one afternoon when the sun was lowering in the sky and picking out the shapes in the undulating hills. The site was perfect: a nice long curve with bridges at either end for a higher view point. From the Warwickshire end the church dominated the skyline. Then there was the all the canal history right there in the marina, and the beautiful junction roving bridge, and lots of great pubs. The on the outside of the curve the bank had eroded quite significantly leading to the illusion of a wide stretch of canal. The eroded bit was only about a foot deep. This meant I could place the spires on the bed of the cut without encroaching on the navigation channel. At only a foot deep it also meant that the spires would be safe from even the most novice of boater. The spires were constructed out of marine ply, engineered by local (to me) designers FoskettHylton. The pieces were cut on CNC router in Kendal and finished by hand in my studio. The red fabric – a waterproof nylon that I knew held the colour – was laser cut for precision and to maintain crisp lines and laboriously sewn up on my ageing machine. The whole structure then sat on a steel basket (fabricated by Les Harrison in Penrith) which held 100kg of concrete ballast. 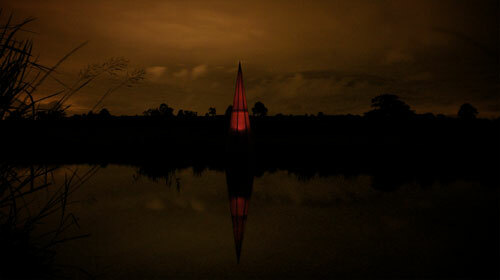 As a last minute thing, it was suggested the spires could light up at night. THis was done using a couple of LED spot lights mounted halfway up inside and powered by a solar panel on the bank. The illumination was more of a glow, but as it happened, they still looked quite impressive after dark. Despite its simplicity, I think it’s quite difficult to describe SevenSpires and how it works. 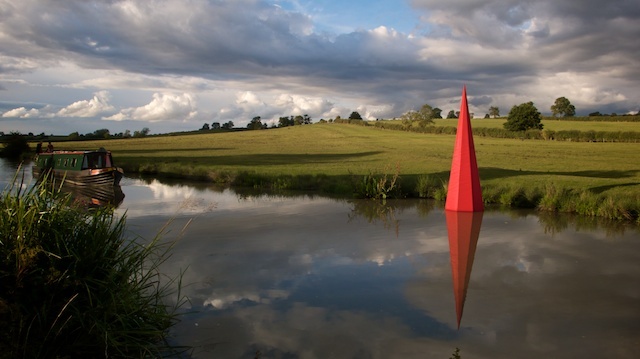 It certainly looks effortless – a line of big red triangles in the canal. They certainly got photographed. A lot. However, the reason they got photographed a lot is because they looked good on camera. A quick trawl through Flickr and you start to discover some of the tricks. Call me old fashioned but I’m a big fan of composition and like it or not, composition can make or break an image. What worked best for me at Braunston was the strength of the sightlines. Those great angles which present themselves to even the most basic of photographer. The way the red stands out against the green backdrop is only part of it. The alignments of spires, the reflections, the echo of the church on the hill, the framing of the bridges. Little compositional tricks which seem to reveal themselves as you walk along the towpath. The sense of reveal – you typically only saw three spires at a time – was even stronger when travelling through them on a boat. That was all the planned stuff. That’s what I wanted it to do, and I’m chuffed that’s how so many people experienced them – as things to make the photos look good. But tere were other things too. THings I half expected but which worked far better than I imagined. These were the subtle bits. The bits which don’t photograph well. The way they sat as perfect gepmetric shapes in a very organic landscape. The way the described the line of the canal from a distance when you couldn’t even see there was a canal. They had a very distinct presence about them and one which made the landscape feel very empty after they were taken out. But best of all was the light! Come 7pm every evening, the sun dipped below the clouds and even on the dullest day there was this amazing evening light which just lit up the spires and threw those long shadows across the ridge and furrow fields. For about 20 minutes a day it was purely magical.